Have you noticed unlevel or bouncy floors in your home? If so, there is a good chance your crawl space is experiencing structural problems that are causing it to sink or sag in the middle. Crawl spaces experience structural sagging for three primary reasons: support columns spaced too far apart, rot-weakened joists, girders, and posts, and columns settling due to weak soil or poor footings. If you have tilting or sinking crawl space supports, too few supports, moist, rotting wood, sagging, sloping, or uneven floors, cracks in interior drywall, or door and window frames that are skewed and unlevel, it's time to call in a professional. At Total Foundation Solutions, we specialize in stabilizing sinking crawl spaces. We can install crawl space supports to ensure that your structure is properly stabilized while also adding an encapsulation system to prevent mold and rot. If you're interested in crawl space repair for your home, give us a call today to get a free estimate in Edinboro, Warren, Erie and the nearby areas! A floor joist shows signs of compression due to the weight of the home -- and too few support posts. Fast, year-round installation: The SmartJack® can be installed year-round, with installations completed in about a day. There's no waiting time for concrete to cure! Stronger crawl space support: Our crawl space support system can support vertical loads exceeding 60,000 pounds, which is far stronger than conventional concrete repairs. Versatile installation: The SmartJack®'s portable size allows it to be installed in even the tightest of crawl spaces. Superior lifting: Our support jacks do more than merely halt the downward movement of your floor. The SmartJack® may also be adjusted to try to lift the floor above to its original position. At Total Foundation Solutions, we recommend installing the SmartJack® System, which uses adjustable, heavy-duty steel crawl space jack posts. These posts install quickly in a home and provide the best solution for restoring stability to your structure. The SmartJack® system can be installed in tight conditions, usually in less than a day. Made with galvanized steel for corrosion resistance, it can support vertical loads exceeding 60,000 lbs. The adjustable design of our crawl space jack system means that sagging floors can not only be stabilized; they can also be restored to their original position in many cases. To address the issue of poor supporting soils, each crawl space jack distributes the weight of the home through a precast concrete footing and a base of engineered fill material. The SmartJack® is the only solution that addresses problem soils during crawl space restabilization! 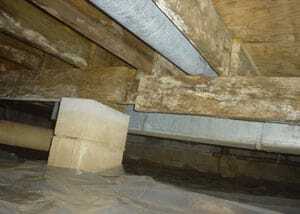 A moldy, unsupported girder (right) sinks under the weight of a home -- due to an improperly installed crawl space support. Preparing for installation: Our system design specialists will determine the best plan for your home's needs, mapping out the location for each crawl space support jack. The installers will excavate a 2' square, 2' deep hole at each SmartJack® location that will be prepared with engineered fill consisting of tightly compacted crushed stone. Placing the pre-cast footing: A pre-cast concrete base (or footing) is placed on top of the engineered fill and carefully leveled to serve as a stable base for the steel jack post. The engineered fill base underneath the footing provides solid support that won't shift, settle or be affected by soil moisture. Cutting the jack posts to length: Once new bases have been installed, measurements are made for the steel crawl space jack posts, and the posts are cut to length. The steel tube used in each SmartJack® is manufactured with a triple-layer, in-line galvanized coating. Assembling and tightening: Each crawl space jack post is assembled in your crawl space. The top of the crawl space jack is mounted against the girder, and the installation is carefully plumbed. Each SmartJack® is then tightened in an attempt to lift the floor back to its original position, straightening and leveling floors, closing cracks in walls, and halting future downward movement. The jacks will continue to be adjustable for future tightening, should you need it. 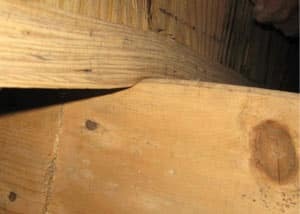 Encapsulating the crawl space: If your wood crawl space joists, girders, and/or supports were damaged by mold, rot, and moisture, then you will want to address these issues to prevent future damage. The encapsulation process involves sealing all crawl space vents, installing an airtight crawl space door, and lining crawl space walls and floors with a durable plastic liner. This treatment can also include additional drainage measures like installing interior drains and a sump pump. Encapsulation stops moisture-related damage and associated structural problems that occur when framing members rot and deteriorate. We're your local crawl space structural support contractors! If you'd like a permanent solution for your crawl space issues or any other foundation floor problem, we're ready to help you. We offer free crawl space structural repair quotes to homeowners in the Pennsylvania and New York area. To schedule your free, on-site inspection and written estimate, call or e-mail us today! We proudly offer all our foundation repair services in Warren, Erie, Edinboro, Jamestown, Fredonia, Meadville, Du Bois, Harborcreek, Hermitage, Olean and throughout the surrounding areas.